With the help of our technical advancement skills, we offer an extensive range of Electric Power Jack. Our Electric Power Jack is widely used in different industrial sector and we acclaimed prominent position in this industry. They are resistant to abrasion, sturdy in construction and dimensionally accurate in every aspect. We are one of the foremost firms of Power Screw Jack. Besides, we present this product at nominal rates to our customers. These linear actuators only need a drive unit. 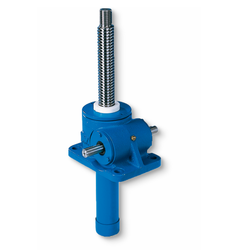 They are suited for applications such as lifting, inclining, turning and positioning. High performance - 3 times longer life compared to previous model Wide variety of types available & optional parts.